You've probably heard me talk about this program lately. I've been working on it for who knows how long -- well over a year -- and there is still a lot more to do. While I kind of gave up on the original BasicNote for monochrome, I'm planning on developing BasicNote CE much further. 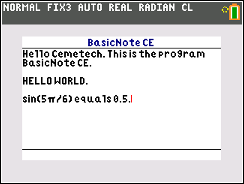 BasicNote CE is an advanced note-taking program, written in pure TI-Basic for the TI-84+ CE. It's purpose is not only to serve as a note-editing and note-saving interface, but also to prove the possibilities of TI-Basic. What are a few of the cool features? ►Simulation of default TI kerning, which helps with rendering. That's hard to tell. I'm currently dealing with the college semester ahead, but I hope to have version 1.0 out by this summer. What is the current state of the program? Lots and lots of bugs. 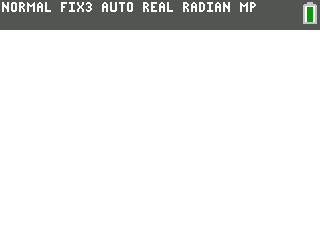 I currently need to fix some of the cursor movement, fix character deletion and character insertion, and more. Despite that, the editing window is already built up quite a bit. I still need to add a menu page to see a list of all the different notes, but that should be fairly easy. How does this compare to other note-taking programs, like in Assembly or C? Well... it doesn't. That's just the nature of TI-Basic. While other languages may be faster, I still believe in pushing the limits of TI-Basic, and I hope to make the program as optimized and as fast as possible. What's the goal of the week? Hooray! I've been looking forward to this project! The reason I'm so excited for this one rather than the ASM/C note programs that are out there, is because I can use a computer keyboard to type! EDIT: Are you planning on only using string? Or converting it to a list? Personally I'd like for it to be converted to a list so my notes don't get overwritten by another program! That looks really cool! How do you make the text wrap? I'd want to know! Keep it up! How big is the program currently? How big do you expect it to be? EDIT: will we be able to somehow extract the data from the string? I wanted to make a program editor in basic, but couldn't get around the fact that the strings' data was completely different from a program's code. Will we be able to somehow extract the data from the string? I wanted to make a program editor in basic, but couldn't get around the fact that the strings' data was completely different from a program's code. Now, you can recall Str1 in a program. Remember you won't be able to use the store token, so you will have to manually add it to the program later. Do you have an organized list of bugs somewhere, either in this code, in a tracker, as // comments in your program, or even just on an organized piece of paper? I've discovered in some of my programs that unless I kept careful track of the bugs I (and others) had found, that some would inevitably get forgotten. Plus I love the satisfaction of crossing a challenging bug off a TODO list. Are you planning on only using string? Or converting it to a list? Personally I'd like for it to be converted to a list so my notes don't get overwritten by another program! Yeah, I'll look into some compression to other data types in the future. No promises though. The only other option I would have is to archive the note string. How do you make the text wrap? Simple - if there's not enough room for more text on the right of the screen, then move everything after the most recent space character onto the next line. In the case that there are no recent space characters, it will simply keep writing text on the next line. I do have several comments throughout my code, but my main bugs list and to-do list are currently stored on my Sticky Notes app on my desktop. Simple - if there's not enough room for more text on the right of the screen, then move everything after the most recent space character onto the next line. In the case that there are no recent space characters, it will simply ignore the text-wrapping routine and continue on. I remember having to make a simple routine that checked whether or not text input reached the end of the screen. How do you handle saving this string and recalling it with word wrap? Does this handle when a word is more than one line long? Every character that the user enters gets added directly onto the note string. 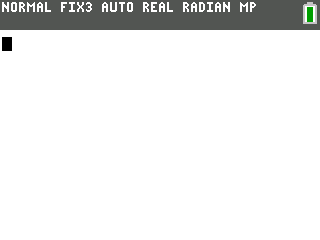 So, whenever a space character is entered, the program saves what position in the string it is at, the X value of the cursor at that spot, and initializes a variable to tell the pixel width since the last space character. If the characters go off the right of the screen, and that pixel width variable is less than a line long, then it takes a substring of the note string starting at the last space character - then displays it on the next line. If the pixel width variable since the last space character is more than one line long, it simply goes to the next line without text wrapping anything. -I just got the [Enter] key working, which means you can do paragraph breaks now. -I added a ton of comments for myself/others on the code, and I'm still trying to fix some of the cursor display issues. Question: Should I keep the flashing red cursor or make it solid? -The note string has delimiters to save where the paragraph breaks are. -I am using a list which stores the amount of characters on each line, along with the pixel width of each line. For the [enter] key, it simply creates a new element in the list and starts adding to the new element. I also have a few lines of note rendering code which is currently in a separate program, which I have adapted to make it understand paragraph breaks. I have mostly finished the character insertion and deletion code, just have a few more things to add and need to polish them up. Also, the cursor movement code is currently begging for an overhaul, and it also needs to be changed to understand paragraph breaks. In addition, (it's a bit hard to describe, but) I need to add an imaginary vertical line for up and down movement, that the cursor tries to stick to, like you see in many famous text editors. More screenies coming soon - I'm going to try to get CEmu working here in a moment. This gif shows some of the capabilities so far, including word wrapping, paragraph breaks, backspacing, and inserting. It may look simple on the outside but there is some powerful code behind what you see here. The second program I ran at the end is the current text rendering code, which is only a few lines long; it uses the CNOTE list and the string to understand what should be displayed where. It will be integrated into the main program at a later date. I was wondering how you'd remember where the line breaks are in word wrapping! This is an awesome project; I can't imagine how much work was put into this. I made a CE text input system for a project of mine (granted, it's not as featureful as this one), so I know this is hard. Good job! I’ve added some rough page up and page down buttons, and had my first go at implementing scrolling. Still needs some fixing of course, and the rest of the code needs fixing to accommodate the new features I’ve added. More eye candy coming soon! I’ve had a few people tell me I should be doing this in a more powerful language like Asm or C or ICE, but where’s the point in that? I’d just be creating an identical text editor like Mateos. Ti-basic may not be as powerful as other languages, but I’m here to prove it can still do what TextEditor already does (and more) without losing too much speed or quality. Multiple (infinite?) pages are now implemented, and some scrolling buttons as I mentioned earlier. With the new developments of my program, other parts of my code need updating. For example, the code that controls the cursor (where it can go and be displayed, and where in the string it is placed internally) is probably the biggest monster of my program, and doesn't work especially with the new developments. The current goal is to go back and attack this monster before it gets bigger. Ooooh, this looks super awesome! When rendering any text, does it display the characters one by one or all at the same time with Text( ? Best of luck with this awesome project! Each entire row is displayed with the Text( command The text editor itself knows the width of each token (using another string as storage for pixel width info) so that natural spacing can be achieved while writing something. Progress is somewhat slow but it's getting there; in the past week or so, I've completely redone the cursor movement code, and if I'm correct, it should work flawlessly now. I've tested it over and over and for the moment, there are no issues. As you can see in the screenshot below, I currently have a debugging display at the bottom. The character is the one behind the cursor, and for the curious, the number displayed is the width of the row the cursor is on. Plan out storage methods -> use list compression? DISCLAIMER: Idk much about the CE's internal number system, exept from observation. Due to the CE's number accuracy, you could squeeze more bytes into one index of the list than three. However, three is the number of bytes for ICE intergers, which are based on the calc's internal number format. Although, the calc is able to work with numbers much higher than 16777215, so it is more likely a four to six byte format, which would likely include sign and exponent into an extra byte! And, due to the fact that exponents go into decimals as well: you may be able to get a larger number than 255 from the logarithm plus the sign multiplied by 256, instead of 128. In other words, EXTRA FORMATTING! © Copyright 2000-2019 Cemetech & Christopher Mitchell :: Page Execution Time: 0.153058 seconds.